Had one small issue with the 3rd board, heater wasn't working. Turned out to have a very small piece of debris in the indicated area shorting pin 1 of U6 and C9, flushed it out with a soft brush and all is good. I'm still debating on the enclosure, was originally going to gut my old 731A and install ~3 boards or so, haven't decided yet. Just a head's up and suggestion: You're using '2057 op-amps which have a tremendous amount of input current noise compared to LT1013, in addition to SMT package which make very good board stress detectors. Beside excess current noise on your extra-long board traces, that additional mechanical stress on the LTZ die caused by AC current noise -can- cause stability problems long term, be aware. It can also cause die breakdown in extreme cases. We have seen this effect in other circuits as well, that's why we quit using'2057's in almost all test circuits a few years ago. The '2057 is not a cure-all for everything, not by a long shot. It can work, but not really what you want for very long term stability as an LTZ current driver. See page 18 of the '2057 datasheet, and then start really measuring the current noise compared to a '1013, and you'll see what I mean. If you want to keep shaking your LTZ die, the '2057 is just the part to do the job! The -only- recommended op-amp for use with LTZ is the LT1013 (recommended package for best performance is DIP version, ceramic is available too), and there is absolutely no reason NOT to use one, as others have noted here several times. Your circuit will be just as stable - the slight Vos of the '1013 will have virtually no effect on output. If you call LT applications, they will strongly advise against the '2057 as well if you are going for high stability, low current noise and low radiated noise on inputs and power busses. The best defense against noise is to NOT generate it in the first place. Watch out on those surface mount caps also - not really recommended practice on a precision Vref. They are very microphonic and will show you board stresses as well. Just something to be aware of when you mount these boards up. I would also be careful of 12k over 1k. That's pretty cool. We've never had issue with 13k over 1k or even 15k over 1k - plenty of those are perfectly stable after decades. When I say stable, that means they still don't move a ppm per year. Which is the realistic limit of measuring any volt-referenced anything at a cal lab. The overall stability of your LTZ - all else being the same and correct - will be swamped by the crystal lattice stresses in the die itself (and where it was cut from the wafer), and there isn't anything you can do about that except wait. A. Long. Time. for stresses to spread and stabilize. It will be pretty close after a few days run time, but it takes exponentially long to expose the true story of each LTZ when you're chasing down into low PPM's. As others pointed out: Resistors standing on end is about the last thing you want for low thermal difference between leads, that could also be a source of that huge noise you're seeing on output. Of course the LTZ has to be kept covered. With that flopping around in the breeze like that you will definitely see a lot of noise just from airflow around the device. After soldering, do your final measurements at least 8 to 12 months out at least and compared to 732b's or 732a's if you have access to several - at least three. No DMM is good enough to tell you the whole story with these LTZ's. Nulling against a known stable reference will give you a better picture of stability. The boards you just made are infants and need a -very- long time to become stable again. You might see some stability after a few months but we cook 'em at least 12 months or longer if the application is critical. Form the pure specs the noise current of the LTC2057 is not that bad: like twice the LT1013 at 1 kHz and maybe even lower than the LT1013 in the sub 1 Hz range as the current-noise of the LT1013 will go up there. However bias currents and possibly current noise could be higher when working at the low 0.7 V common mode voltage. The problem is that the current noise of AZ OPs is not normal, mainly low frequency noise, but there is also a significant higher frequency background. Performance of AZ OPs depends in a more complicated way on the input impedance, than just giving a current noise number. So depending on the sensitivity of the circuit, there can be extra trouble. There is just very little to gain in using the LTC2057, but a lot of possible trouble. The LT1013 is perfectly good enough - if you for some reason can't get one form Linear, use the more or less direct replacement from Ti. Before changing the OPs there are other points in the typical LTZ1000 circuit, e.g. temperature regulation at low power (this could be a issue with a 12K/1K divider), the 400 K resistor for TC compensation, EMC, lower sensitivity to the temperature set-point and the thermal design. You need to cover the LTZ1000 and have a case around the whole board before you can really tell how good it is working. This is especially true with the way the resistors are mounted. The two 12k/1k boards are intentionally borderline, the 3rd is 15k/1k, and the remaining two will be 13k/1k most likely, all with the 2057. I think then I'm going to build (5) more, but with a layout that will properly accommodate Edwin's 802 series and the DIP 1013, perhaps a few other mods. If it is for the boards already made, there is the LT1006 as a single version of the LT1013. So there is an easy way back from the LTC2057 idea. As the chips are relatively far away from the LTZ, the SMD form may not be that bad. Also not all of the LTZ1000 are equal: the TC without temperature stabilization (but still at the high temperature) can be quite different. To a first approximation the rather good temperature stabilization covers this, but those units with a lower intrinsic TC will be less sensitive to drift in the divider that sets the temperature. This could be important if you compare performance. If you use more of the LTZ1000 at different temperature or current, it might be even worth picking the right ones for each temperature / current combination. Having half the TC for the chip could be as good as half the drift for the divider. Also not all of the LTZ1000 are equal: the TC without temperature stabilization (but still at the high temperature) can be quite different. what differences did you measure at the unstabilized T.C. ? Having half the TC for the chip could be as good as half the drift for the divider. Where do you get those devices with a halfed value of unheated T.C. ? Up to now I had less than +/-5% variation in unheated T.C. Kleinstein touched the tip of the iceberg here, and after you spend some bench time testing AZ amp like '2057 and their ilk, you realize how close the datasheets come to what Mark Twain was talking about: "There are three kinds of lies: lies, damned lies, and statistics." The datasheets rush to show you the apparently low current input noise of these things, and then try to not really mention what's really going on with transient input current noise happening at the amp's chopper frequency, and then of course at harmonics up from there. When you look at the input current chopper noise of a '2057 or similar - just from the datasheet - it looks like maybe you still have maybe double the input current noise of an LT1013, but still low. NOT EXACTLY! How about 100X to 600X the current noise when you look at those current spikes in detail! 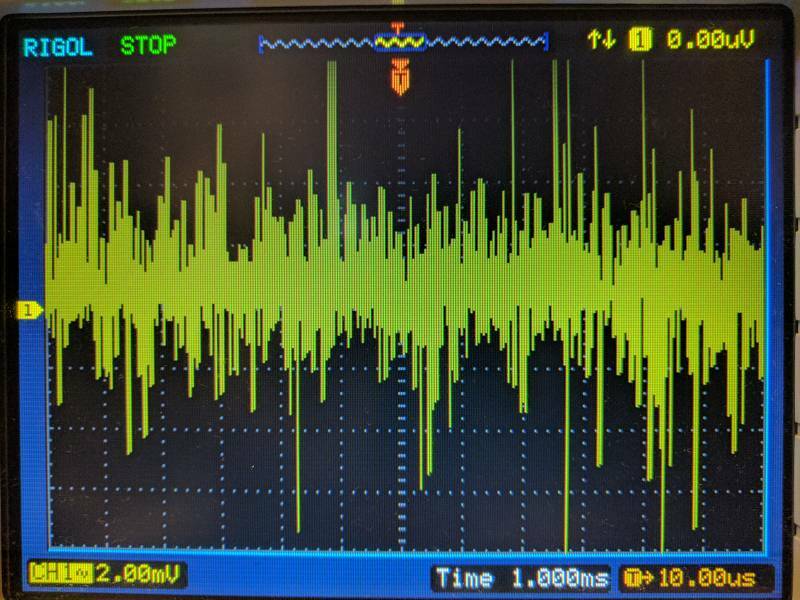 At first you thought you were talking about some pA or nA of current noise - but suddenly you realize you got input current spikes of some uA pounding around your sensitive circuit! 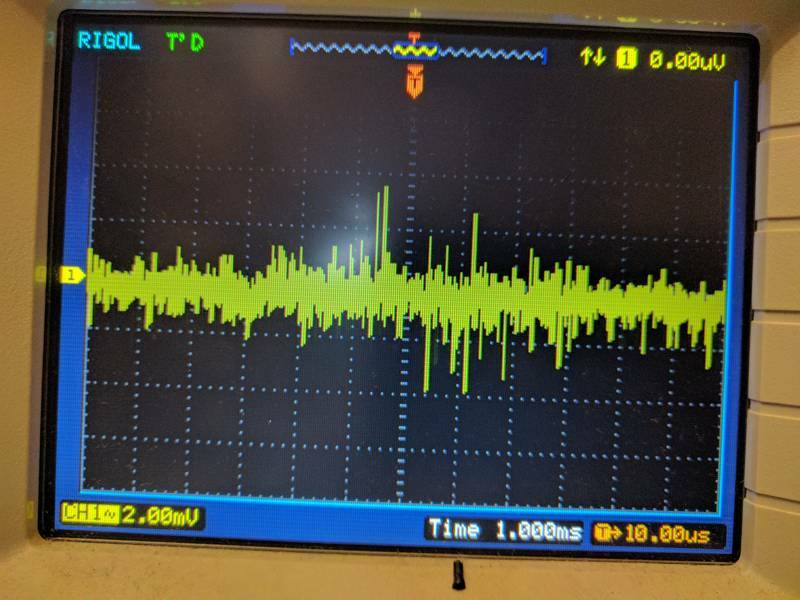 If you look at the LTC2057 datasheet, do you see how the current input noise AT the chopper freq. isn't mentioned a lot? So you take an LTZ1000 - which wants a QUIET QUIET QUIET and un-eventful current flow, and in return coverts that to a stable voltage across it's zener diode + transistor Vbe voltage drops - and when you slap a clock-driven, commutation switched auto-zero op amp in there an you get BLAM BLAM BLAM current spikes applied directly to the LTZ die - especially from the inverting amp input. Those sharp, short current spikes get converted into mechanical stress waves inside the substrate crystal lattice. It's like you're hitting the LTZ die with a very small, but definite hammer effect of an AC current pulse train. These disturbances in crystal stress will start at Chopper at frequency, but by the time they reflect and modulate around the edges if the die you'll see detectable stress acoustics up into the low Mhz region. Not to mention the other thing that happens with AZ amps: Any trace length and enclosed loop area on the amp inputs will become antennas for noise radiation of what otherwise was a very quiet, beautiful, pristine analog circuit. Especially if you have "Crop Circles" type traces or "Voodoo Slots" around the LTZ (Not complaining about TiN's board at all, but we've never seen -any- improvement with those types of design tricks - but can and does pickup and radiate noise more when traces are too long and not very efficient layout) Just when you thought you had a quiet analog board - that AZ amp inputs and power rails will be splattering ~100kHz or whatever chopper frequency hash around the area. It is a low current, but it can have enough energy to mess up nearby sensitive circuits for sure if you're not ready for it. In some cases those AZ current spikes over time can drive a crack in to the crystal substrate of whatever they are connected to - usually if there was an edge defect to begin with. For these reasons above (and because an AZ amp offers virtually no benefit to an LTZ current driver) is why LT does NOT recommend the use of an Auto Zero type amp for an LTZ. There are other applications for an AZ amp, but this definitely is not one of them. Remember: Plenty of workhorse 3458a's out there with ppm / yr drift rates down in the Low-PPM mud, and virtually completely stable for decades without a fuss. There are no AZ amps, slots or crop circles required. If the basic datasheet circuit is followed with a good, reasonable, efficient compact board layout - this is very hard to beat for max performance and reliability. There may be a slight thermal gradient on the non-fancy board, but if the gradient is stable (it usually is inside an enclosure) there is no effect on output. You keep air drafts away but do not OVER-insulate the LTZ board, which is just as bad as no covering at all (because the heater circuit can't servo correctly in a near 100% thermal-insulated environment). You select your heater ratio resistors for best performance in YOUR enclosure and application. After that the majority of the drift rate is dictated by the LTZ die itself, and that is beyond anyone's control after the die is singulated from the master production wafer. "It is what it is" at that point and the basic long term drift characteristics are locked in for each LTZ die at that exact moment in time it becomes separated from its siblings. SO: In general, your Auto-Zero amp board will probably work as we're still talking fairly low current spikes input noise, but the use of Auto Zero amps with high-precision LTZ class circuits is really not recommended engineering practice - ESPECIALLY IF you are connecting a precision, sensitive die directly to the AZ amp inputs. For instance an LTZ, photodiode, zener, etc. Also you have to mitigate the chopper noise you're injecting on those op-amp power rails also, which is not insignificant either. Sometimes you realize that it's more profitable from a noise mitigation standpoint to just perform an occasional drift correction by using a conventional amp. For the LTZ circuit especially, the '1013 is the best amp to use, and will offer maximum performance up to and including what the LTZ die is going to give you. It is tailor-made for the LTZ application. For further reading, I suggest taking a look at Art of Electronics Third Edition, Horowitz & Hill - look at chapter 5.10 and the section on precision op-amps. Around page 335 it gets more interesting describing most AZ amp architectures - and their test results vs datasheet noise claims. I just realized - I suggest this thread should possibly be merged back into the main LTZ1000 discussion, for easier reading for future readers and students of precision Vrefs. This is no longer on-topic of "A Little Jumper"
So after being unhappy with first KX I build another sample ... but I have exactly the same problems. So decided to scope the output and found it very nosier ... LTZ1000 was measured with spring probe directly to the KX out (minimal ground loop). The other two with long ground loop as I I don't want to tear down the LM399 reference. And for the battery I used crocodile ground clip. Don't know what too think ... but it seems too much noise for a reference. Even if too early, the modules seems to be in spec at 100 NPCL with less than 1uV p2p noise in the short term. unless you are having a factor 1000/10000 amplifier in front of your scope you are doing something wrong. (or you are measuring the noise from your scope). Try to supply the references from battery + use a metal cookies box (connected to ground of the scope) for your reference. You are right, I was probing directly at KX pcb but I forget to remove leads that where attached to the 3458a. Now without leads is like this ... it seems better than battery. You cannot ask more from the poor Rigol. Is it really better than the coin cell? Yes Andreas you are right (again). Here is output scaled to 2mV. 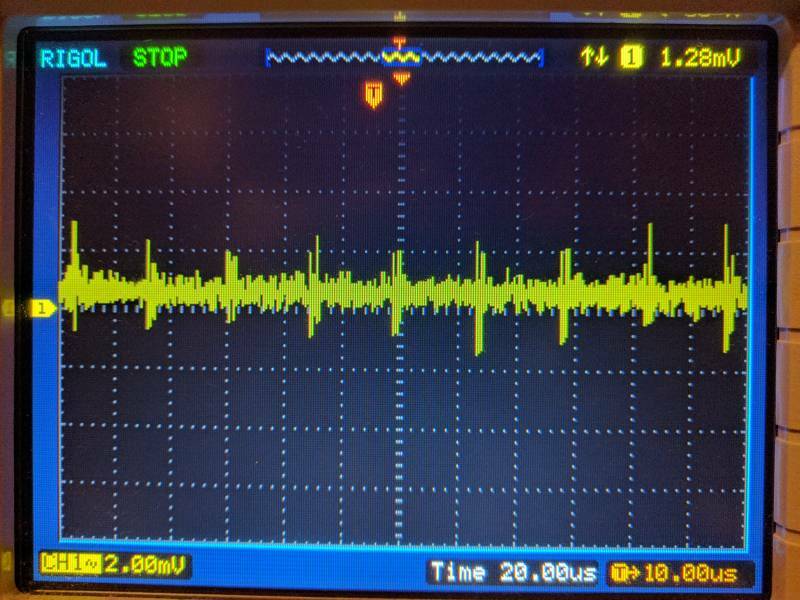 now it looks like noise from a ~60 kHz switchmode supply. nothing I have ever seen from a reference. Yes I measured same frequency also with battery ... so deftly picking up somewhere. Maybe some coupling with scope power supply. It seems I'm not lucky with this KX reference. At the end I found way to cure the "power supply brand susceptibility" and reduce EMI to acceptable level (less than 0.15 ppm): the cure was to use LT1006. But I still have huge stability problems. 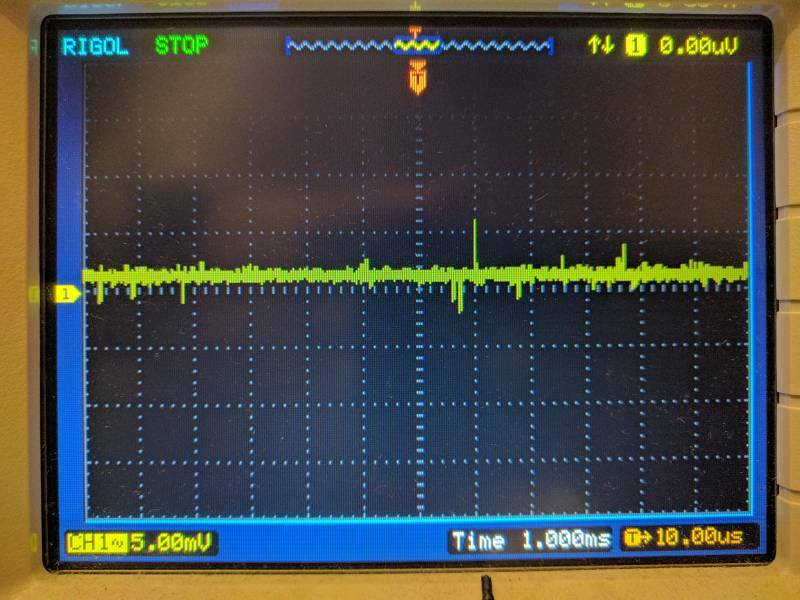 If I swap the zener output on the 3458a (LTZ1000 positive connected to LO and ground connected to positive) I get a difference of many ppm, don't think this is supposed to happen. 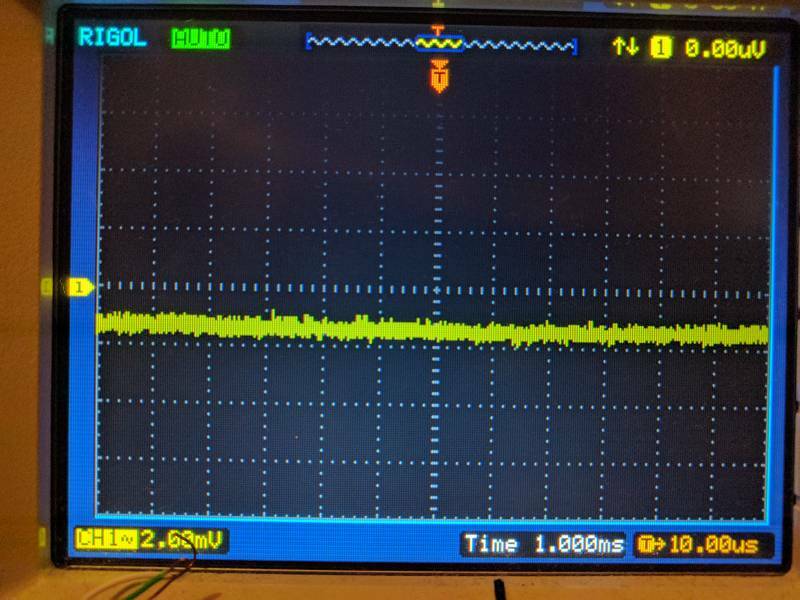 If I swap the zener output on the 3458a (LTZ1000 positive connected to LO and ground connected to positive) I get a difference of many ppm, don't think this is supposed to happen. the first sounds like a EMI problem. you could test for a capacitive load problem by inserting a 100 Ohms resistor in series to the output. (in high impedance mode of the meters). Usually Op-Amps can withstand directly about 1 nF. (around 10 m of coax). a cure to both effects could be done by modifying the buffer OP-AMP similar to my LTZ1047B design. (series resistor + output EMI capacitor + bandwidth limiting capacitor in the feedback path). The typical LTZ1000 circuit adds some gain to the feedback loop and thus tends to make the output OP even more sensitive to capacitive load than the simple V=1 follower circuit. So it really is a good idea to have some isolation against capacitive load. So even 100 pF could be a problem for that circuit. How sensitive an OP is to capacitive loading depends on the OP. Some are more sensitive than others. Some start oscillation at 100 pF other can stand 10 nF if the rest of the circuit is good. As a relative low power OP the LT1006 is more like a sensitive one and DS curves are for 10 pF - not the more common 50pF or 100 pF. So the DMM input could already be too much. I build a total of 3 of this references, all had the same problem. With LT2057 and ADA4522 this EMI and capacitive load was even worse. I remember millivolt difference with LT2057 and this leads swapping. And for EMI I can make drift it up to 5 ppm by turning on of off a power supply or a led light. Now the question is, this is happening only to me? What resistors are You using? One time I had problems with stability of standard Linear Technology application when I changed resistors from bulk foil to wirewound. Probably it was due to prasitic L and C.
So the buffer has solved stability problems with keithley multimeter. Unfortunately not the 16ppm drift by swapping leads. Now I have keitley stable but with the same 16ppm drift (actually 20 on keithley). @doktor pyta: Resistors are wirewound. I was thinking to this too, but then because I can't remember anyone with this problem in the big ltz thread I discarded this hypothesis. For best performance, Linear Tech (and myself) recommend wire wound resistors for best stability and long term performance. If you have such a high noise field that the resistors might be picking some of that up, you should definitely work on reducing the radiated noise field as it could be strong enough to be interfering with the IC's operation as well. Getting rid of noise at the source is always preferred to trying to dampen it out in the circuits you are using. Many sources, such as lamps, power supplies, TVs, laptops, ect., can generate plenty of noise that will be picked up easily several feet away or more and you make a very good antenna yourself. The only source of noise a wire wound resistor creates is normal Johnson noise, anything else is radiated and picked up. I think Edwin is on the money. But I will gather some data for you tonight with normal/reversal operation on few modules, yet I don't recall any mV-level changes like you mention from past tests. What connection wire you use? How long it is? What connectors on DMM side? This is the case when photo of setup actually says more than paragraph of text. no you are not alone. I also had drift of 3 ppm on a unfiltered buffered output. Others might have lesser EMI around them (your 60 kHz switchmode problem). In your case it seems to be no problem with capacitive loading. In this case the 120 R resistor would be sufficient. After the 120 R resistor you can put a 100nF capacitor against EMI without influence on stability. With EMI problems impedances below 377 Ohms (wave impedance of free air) have usually low effect.